It’s a new year, and here’s a piece that is not representative of most of what we do here. First off, it’s a piece where I wrote the words, when one of the Parlando Project principles is “Other People’s Stories.” So, the words we use here are normally from others, often originally written as page poems by their authors. The Parlando Project adapts, recasts, and performs these pieces with various combinations of original music. Today’s audio, “There is Always Time” was conceived as a song to be sung from the start. It’s been a busy last couple of weeks for me, so my ability to work on new pieces has been slightly curtailed. I’ve had this one done for a month, saved for just such an occasion when I’ve fallen behind in the work that goes into this project—and well, it does seem like a good piece for the day of New Year’s Resolutions. 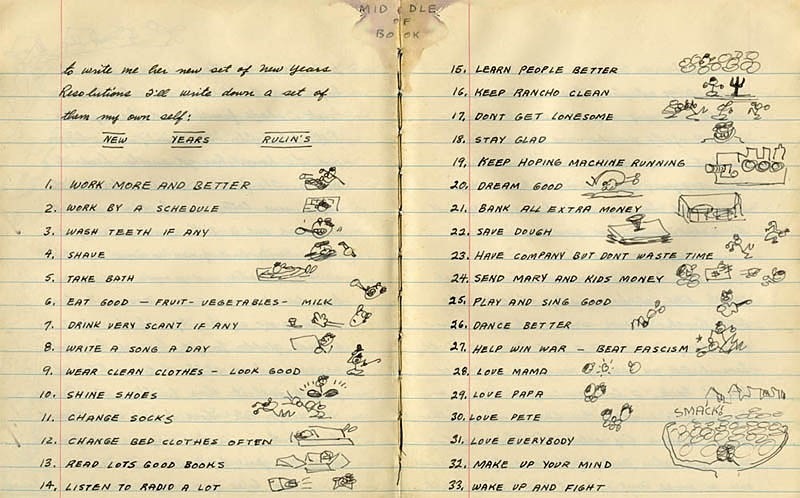 Woody Guthrie’s 1942 NY Resolutions. He didn’t keep all of them—still glad we had a Woody Guthrie. “There is Always Time” is a “carpe diem” song about dreams and desires deferred, so it’s perhaps the precursor to those lists of “shoulds” for the coming year. Goals and focus are good things. Approximately three years ago I set out on just such a goal, to create and present 100 or so audio pieces combining various words and various music. I needed to learn a bit about how to syndicate these pieces via podcasting as well as how to stream them from a blog. Once I started this, I soon found there was even more to learn, more things that will ask to be needed by the work. Since the Parlando Project was launched in August 2016, we’ve exceeded the original goal, and we now near 170 audio pieces published. 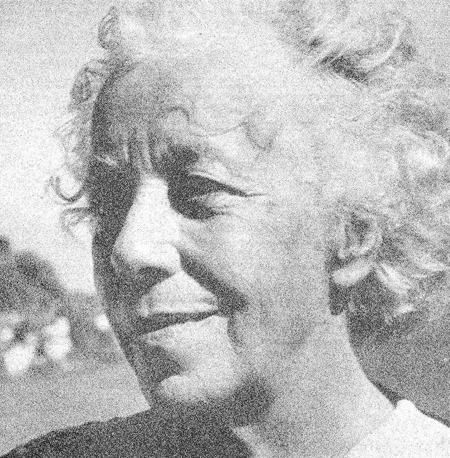 Karen Horney. Beavis and Butthead’s favorite Adlerian psychoanalyst? Wait—what? The Ideal Self is what is going to get me out of those old-year patterns, get me doing those things that I need to do. The Ideal Self will make sure I commit to my art. The Ideal Self will fix those things about myself that keep failing. The Ideal Self will make me a better person, a better co-worker, a better partner, a better parent, a better son or daughter, and so on. What’s wrong with that? Look again at Horney’s formulation: “The Tyranny of the Shoulds.” What if that Ideal Self behaves as a tyrant does? What if instead of being the loving, supportive partner, parent, boss, or teacher that we may or may not have had, the Ideal Self acts as a dictator would: the executions, the inquisitions, the scape-goating, the banishments, the wars of aggression, all waged by the Ideal Self against the poor Real Self, who beaten-down will eventually fail the tyrant or overthrow it. So yes, seize the day, seize the year. Do more and better art this year. Love your partners and your families and your friends while they are here. Repair the world, slowly and little-by-little if you can be patient and brave. Clean out the closet. Ride your bike more. Learn a new instrument. Read more. But be the loving partner to that struggling Real Self. It knows it’s limitations, it’s failures, it’s shames, but it is only your Real Self that can do these things. To hear “There is Always Time,” use the player below. If you like it, go ahead and click the like button, and it’s very helpful if you share the audio pieces or this blog on your own site, or on social media. We’ll be back with more pieces using words by other authors soon. Thank you for the good advice I needed to hear. Happy New Year!